When police were called to the scene of an accident at a roundabout on the A8 they found a car with just three wheels and the driver was over the limit. 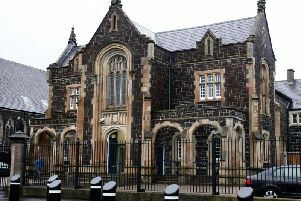 Joel Allen (18), of Corran Manor, Larne, has been banned from driving for a year and fined £200 after admitting charges of driving with excess alcohol in his breath and using a vehicle in a dangerous condition. A prosecutor told Ballymena Magistrates Court that at 9.30pm on October 6 police received a report from a member of the public that there had been a road traffic collision on the A8 and a vehicle was blocking the Belfast-bound lane. Allen was located a short distance away and admitted he had been driving and said a wheel came off as he was on a roundabout. Police discovered the three remaining tyres had low tread and there were tinted windows on the vehicle. Allen was found to have an alcohol/breath reading of 68, with the legal limit being 35. The court heard that he told police he had earlier drank three to four pints and then had an alcopop. A defence lawyer said the defendant had been out with friends that day. He said the defendant was very fortunate someone wasn’t badly hurt or worse in the incident.